They say there were seven cities of Delhi. I say there are 7 cities of Delhi. या रहे उजड़ या बसे गूजर. The patron saint of Delhi was upset with the mighty Emperor because he was diverting laborers from a step well that the saint was building towards the Tughlakabad fort. Emperors, plunderers and even empires that took pride that Sun never sets in our dominion, have come and gone but Delhi, Dilli, Delhi has continued to spread in every direction. 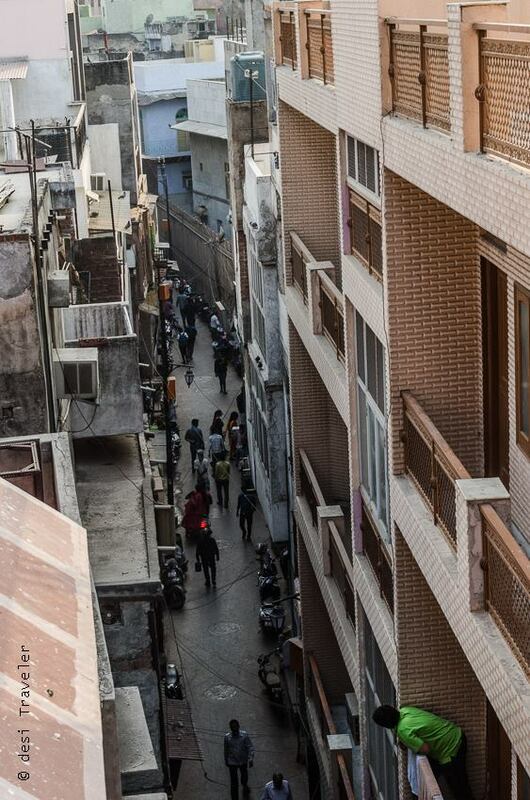 What was once lovingly built by Shahjahan and known as Sheher or “ The City “, is now the Old city of Delhi, know for its lanes so narrow that only poets reach there? And what poets the city of Delhi is blessed with from the divine verses that set the template from Hindi that we speak today first composed by Amir Khusro, to Zauk who refused to leave Delhi even though the riches of Deccan were tempting. (loosely translated it means: Now a day’s Deccan is very good and prosperous, but Zauq who can leave the streets of Delhi?). 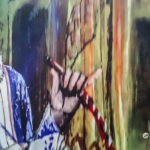 So even during the tumultuous times of plundering by Nadir Shah and later when the voice of Mughal Emperor, lost all its vigor beyond the parapets of Red Fort, Delhi continued to grow and famous poets like Mirza Ghalib made one of its narrow by lanes in Ballimaran his home, in what is now known as Mirza Ghalib Ki Haveli. 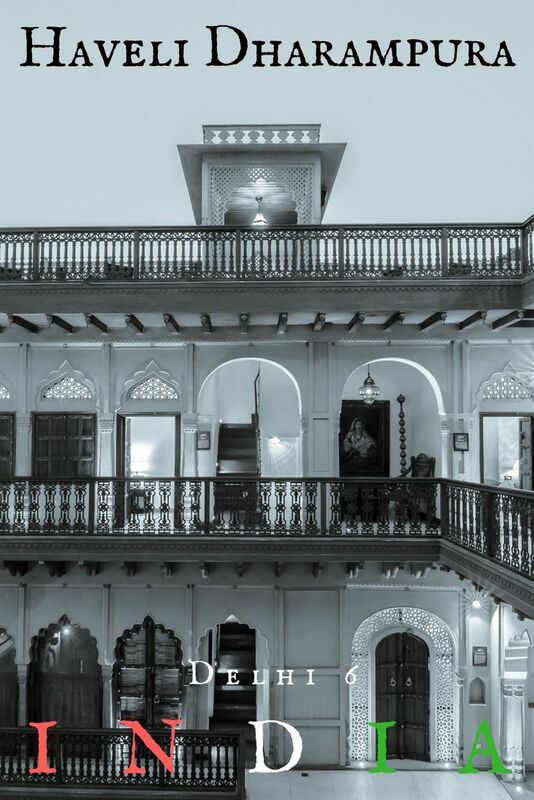 Less than a mile from the beloved poet of Delhi was a dilapidated Haveli without a trace of its glorious past visible. Plaster peeling, walls crumbling, termites nibbling or teak doors and the once opulent rooms subdivided to accommodate the next generation. There was no hope for Haveli Dharampura, as nobody came to the Haveli in a lane so narrow that even if your name is not “Kanoon” you can still touch the houses on both sides by just stretching your arms. 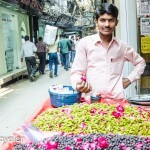 Mr. Goel has been at the forefront of reviving the glory of Chandni Chowk, the market that was named after the alabaster moonlight that bathed the bazaars before its walled got stained by vagaries of time. The restoration took more than 5 years and it was a labor of love where each brick, door, design, window, glass was cleaned, the structure stabilized, truckloads of garbage, debris was removed. The biggest challenge in restoration was that there are no trained, skilled artisans, laborers and architects who are interested in this kind of slow, painful work. So Mr. Goel wandered in Archaeological Survey of India monuments, where any restoration work was going on and talked to the people working there. Carefully taking notes and hiring people who understood the importance of the delicate work involved. 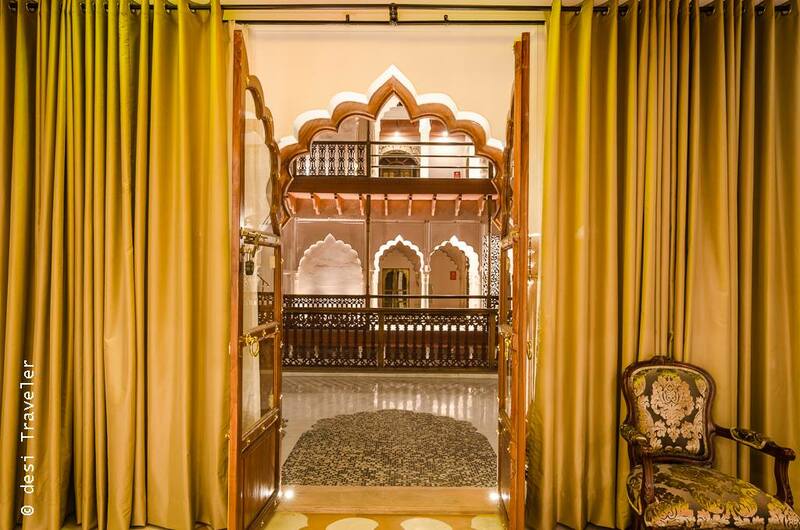 I wish I was a writer of any skill to be able to describe the beauty of the once ugly duckling that has now turned into the beautiful swan aka Heritage Hotel or Haveli Dharampura. 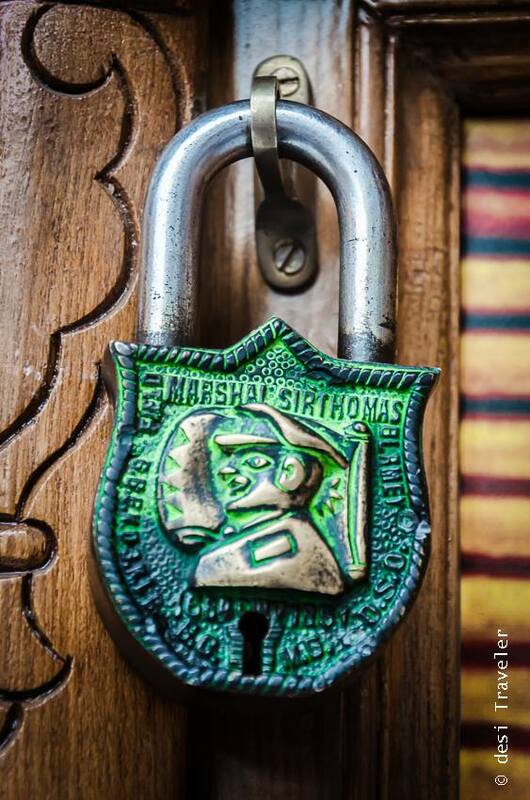 Now this Dharampura name is also a very interesting one. 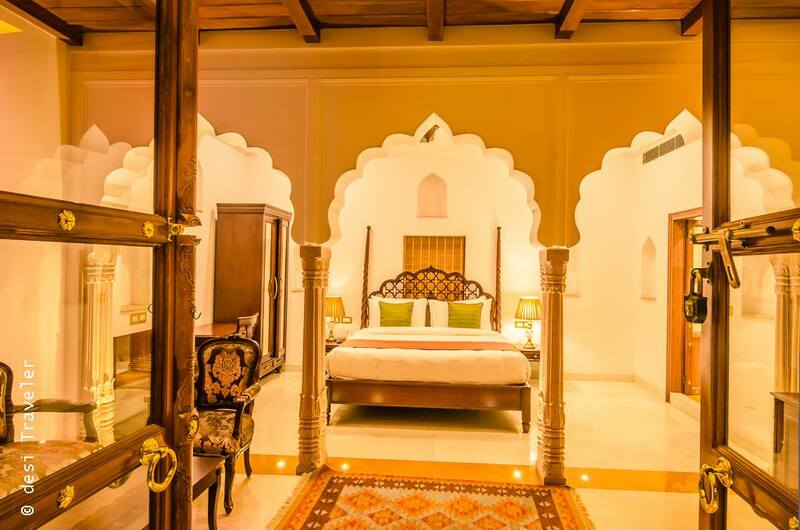 Dharam means – Religion and Pura means area, as the Haveli is situated in an area where you have Jama Masjid the largest mosque in India built by Shahjahan. 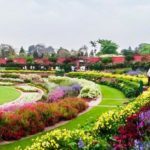 But the name Dharampura combines other religions as within walking distance you have many Jain Temples, the Gauri Shankar Temple and Gurudwara Sis Ganj Sahib . From the roof top you can see the spires of all of them and on a clear day even a Church built during British Raj is visible. As I walk through the little lane, searching for Haveli Dharampura, a shopkeeper, points me towards the Haveli “Continue straight, then take left on the T point that is where you will find Goel Sahib Kee Haveli”. 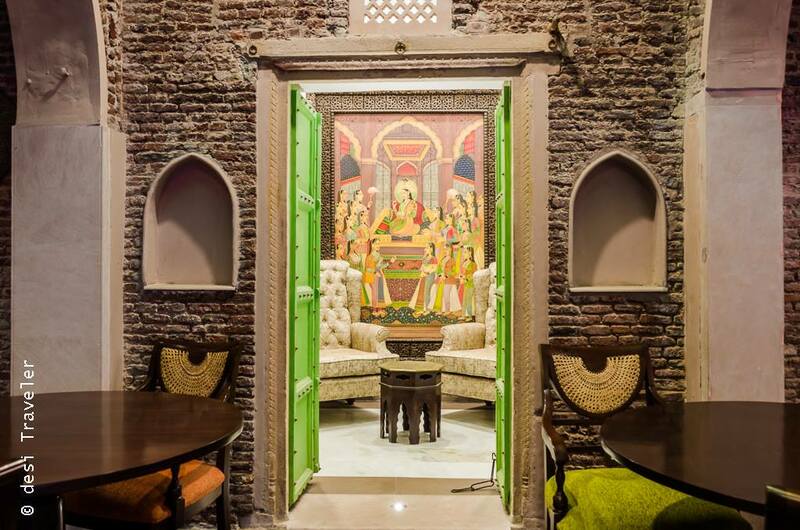 It is obvious the Haveli has created a commotion in the area as not only Haveli but also the lane leading to the Haveli was given a facelift, with garbage removed, streetlights that give a heritage look installed and even walls painted in similar colors. When a major tourist attraction (traveler attraction also baba ) opens up in an area it lifts up the surroundings also due to foot fall creating jobs and pumping money into the local economy. Tiny countries in Europe understood it long ago and now even small villages in Europe are a destination in themselves, organizing their own food festivals, local art and music fairs attracting lakhs of visitors every year. Closer home countries like Singapore have made tourism in a perfect science, giving a consistent, reliable, safe and sovereign supported experience to visitors. So I always feel happy when I see a step in that kind of direction, whether by the government or by enterprising citizens. As I enter the formidable gates that were restored by sending them to Rajasthan (nobody had the skills in Delhi) and reinstalled, I am welcomed by security and they confirm my name in a list of visitors. 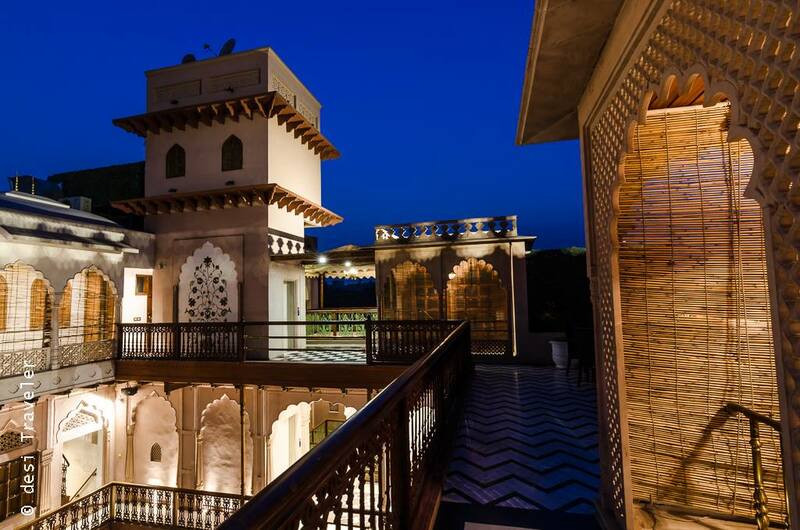 Only then I enter the courtyard that has a marble fountain, a signature of Mughal architecture. 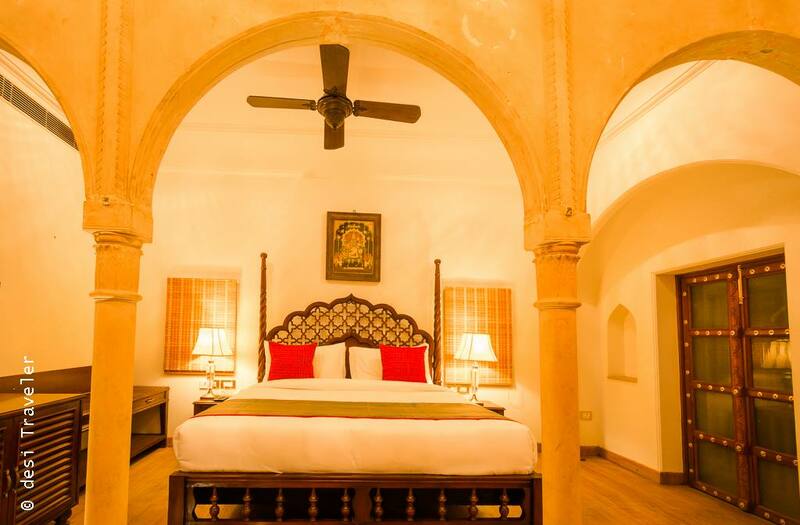 But the Haveli was built originally about 140 years ago and has Mughal, Persian, Rajputana and British influences as all these designs are found in the Haveli. The central courtyard is open to the air, with a pale sky visible 3 floors above. 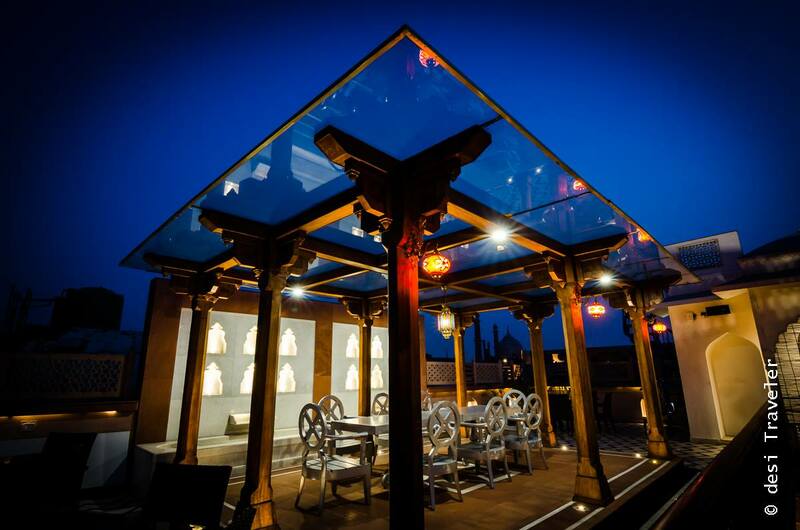 Next to the courtyard is the multi-cuisine restaurant Lakhori of Haveli Dharampura. If you are wondering Lakhori is the name of the red bricks made from red clay and some limestone added to them. These bricks were popular in North India during the Mughal period and can be seen on the walls of the restaurant. As I settle for my lunch I realize the decoration and lighting of the restaurant are for creating a romantic Mughal style aura and not for food bloggers. 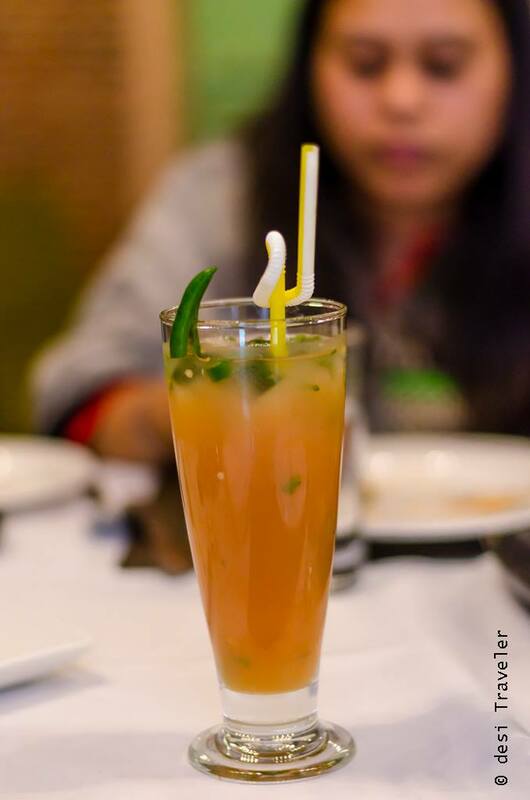 But somehow I manage to click some pictures and tried to memorize the names of dishes and drinks that could easily belong to some Mughal princess. 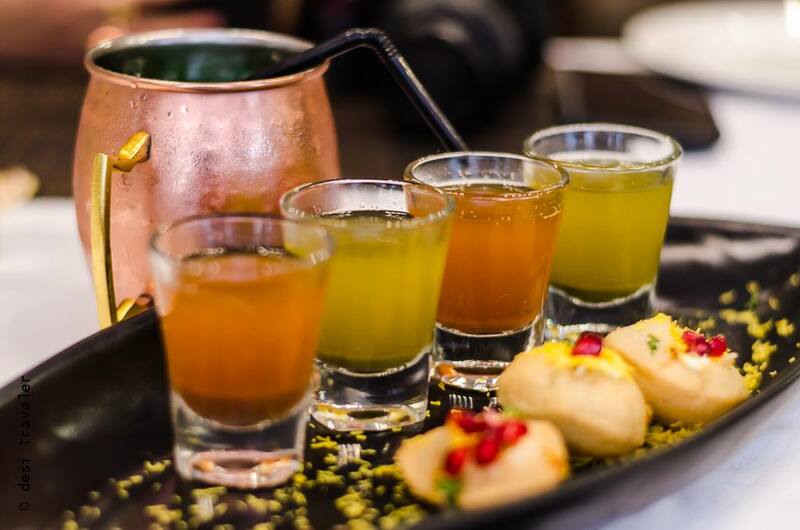 I hear Jahan Ara, More key pankeh, Dogle Kofte, Chai Biscuit, Banarasi Pan, Gali Khazanchi ( but my taste buds are too busy to enjoy the flavors and textures of the fusion of cuisines from the tables of Mughals and the Street food of Chandni Chowk, presented in a very chic style. 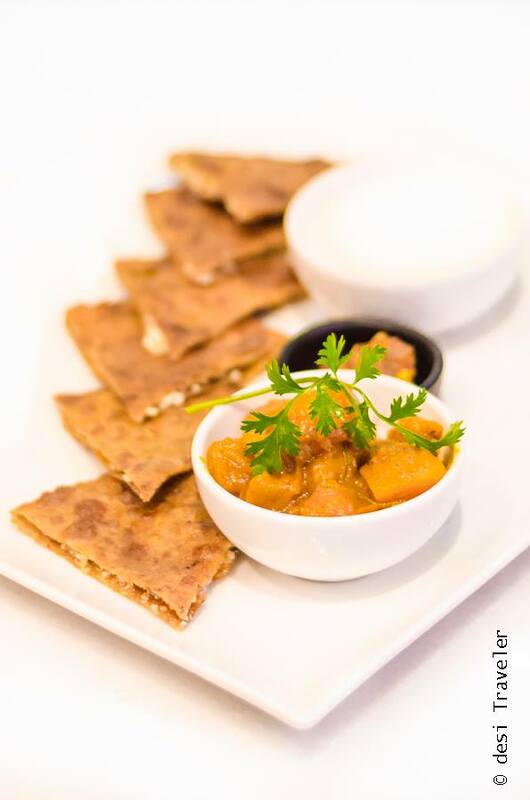 What I liked in the vegetarian food was that in order to make it look and feel modern to appeal to the potential expat, no compromise is done with the spices, and texture. 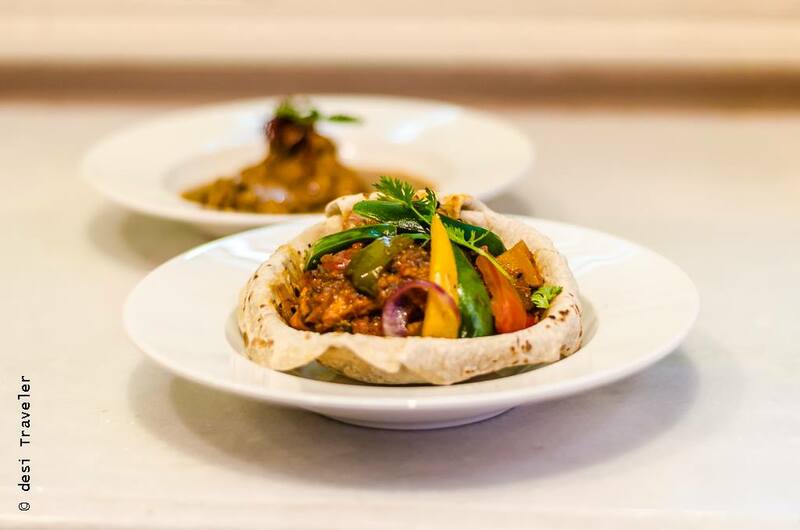 (Ok nonveg types the Haveli Dharampura serve both veg and nonveg food so don’t worry). 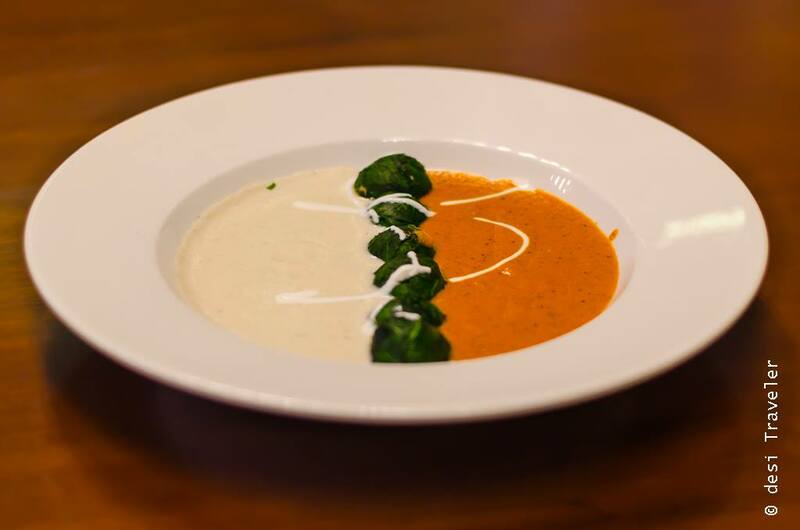 As I was talking to Vidyun Goel, daughter of the owners and the media contact, I learned some interesting stories about how they came up with the menu. 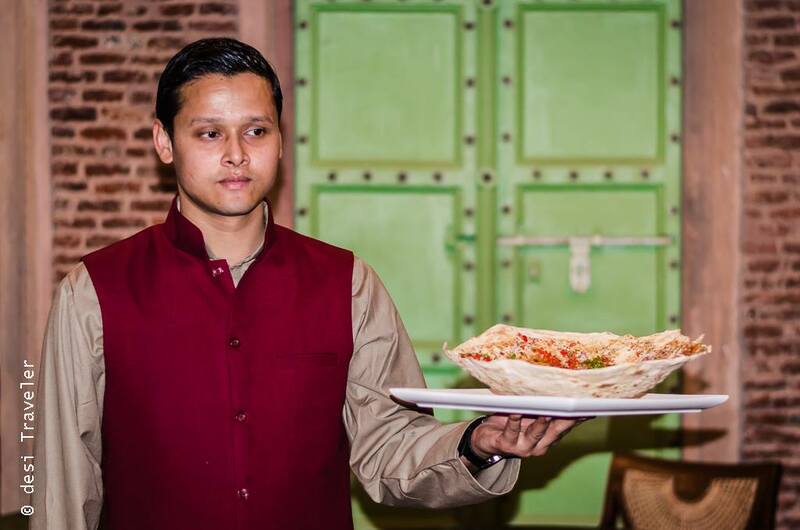 As the family has deep roots in the bazaars of Chandni Chowk, each member knows what Dilli ka Khana means. So each dish was debated, tasted and approved for the menu. 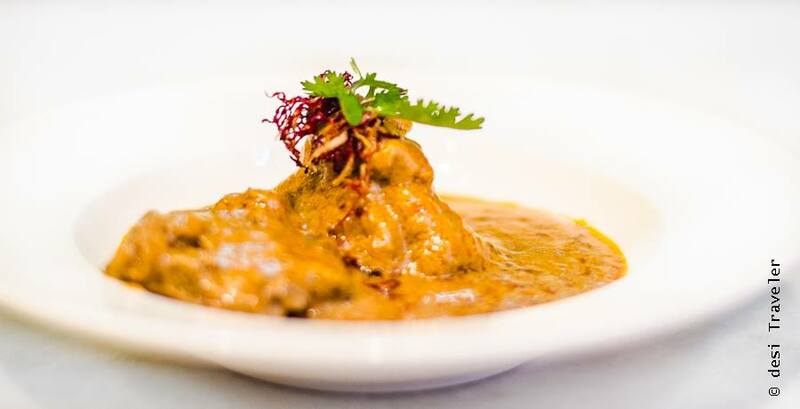 I tried about 10 of them but the menu has around 50 dishes when you add non-vegetarian dishes also. 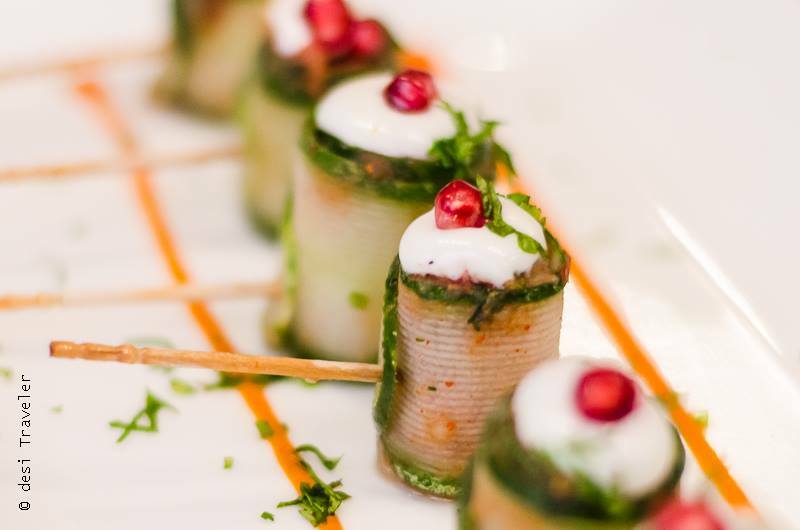 The non-vegetarian dishes posed a unique challenge as the entire Goel family is vegetarian except, the son-in-law of the family. 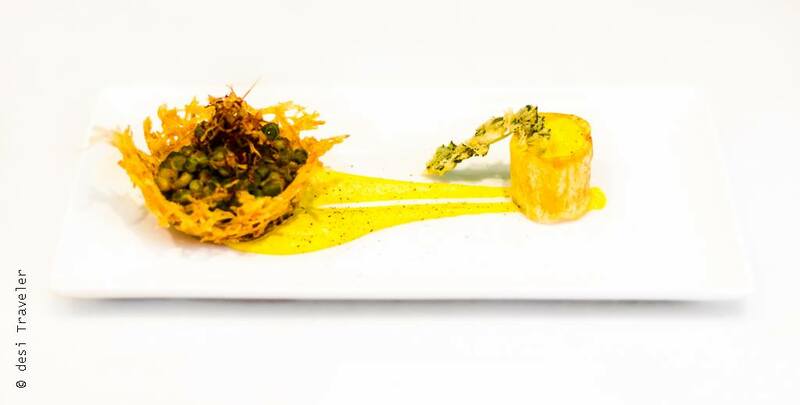 So Vidyun and the chef Pradeep Kuman made the Jamai Raja ( he is Vidyun’s husband if you have not guessed by now ) try all non-vegetarian delicacies and took his opinion on each dish. If you know even a bit about Indian culture you will know that only the very best food is served to the Son in Law when he visits. In some parts of India, we even have a festival called Jamai Shashti, dedicated to the Son in law of the family. So without even trying the NonVegetarian dishes I can safely say they will as good as vegetarian dishes if not better. But as always I do not pass any judgment on a restaurant unless I finish my deserts. 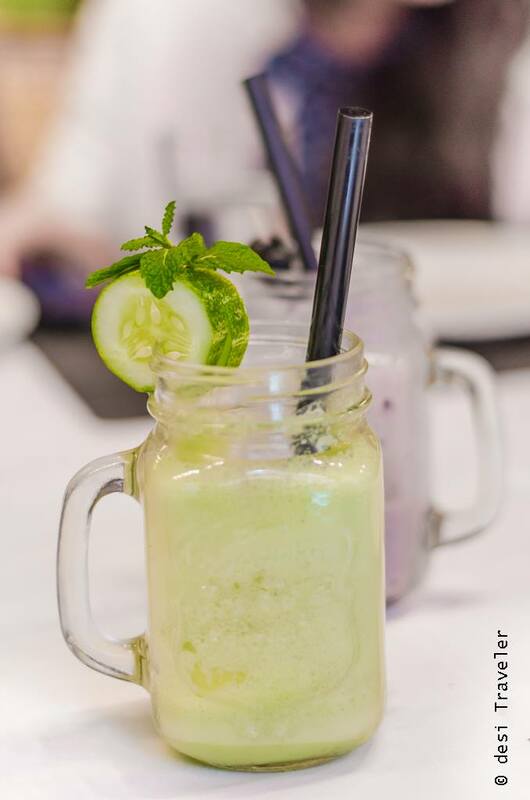 Even at the cost of the wife jee reading this post, I must say I loved the desserts, and the beverages served. 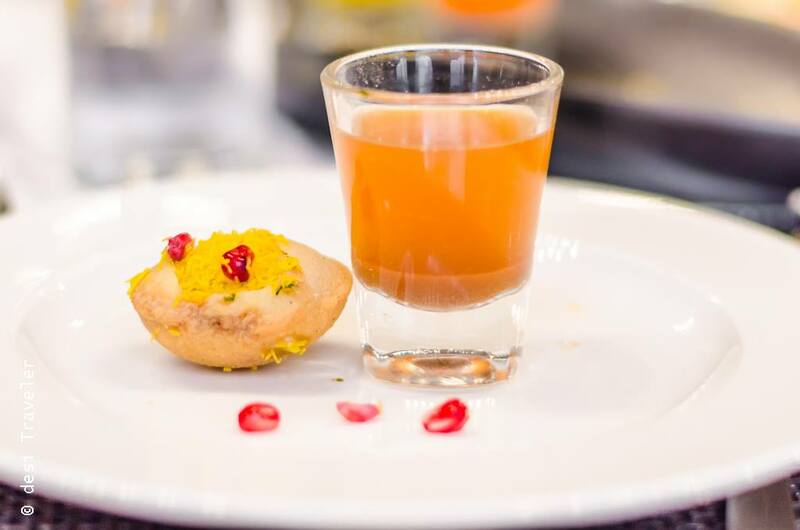 My personal favorite would be Chai Biscuit a milk based drink topped with biscuit crumbs, and l loved the Paan Kulfi, that uses the real paan leaves and not just the flavor and to top it comes wrapped in its own chocolate cones. No, I am not giving you picture of the same. 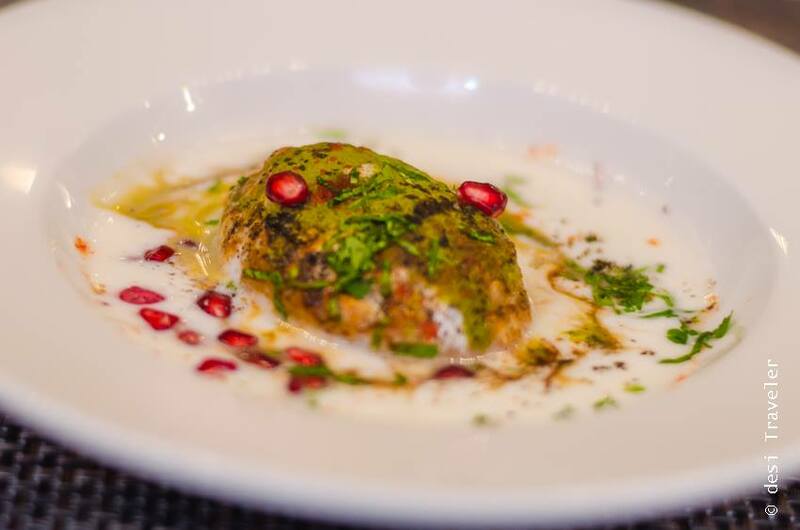 I mean who clicks pictures of Kulfi when it is waiting to melt in your mouth with an explosion of flavors? Go eat your own kulfi and show me if you take any pictures. After the lunch, I just wanted to sleep in a corner but duty called and I went to the rooftop to click some pictures of the area around. 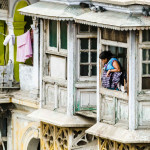 From the rooftop you can see the maze called Chandni Chowk, a pigeon loft on the house next door, some kids flying kites two roofs away, a few sarees hanging on the walls trying to take away the attention from the numerous satellite tv dishes all around. On my right are the minarets of Jama Masjid, on my left, I can see the tricolor our national flag on the-the Red Fort and as I turn towards my southwest, I see the golden domes of Gurudwara Sis Ganj Sahib. Remember the area is called Dharampura? 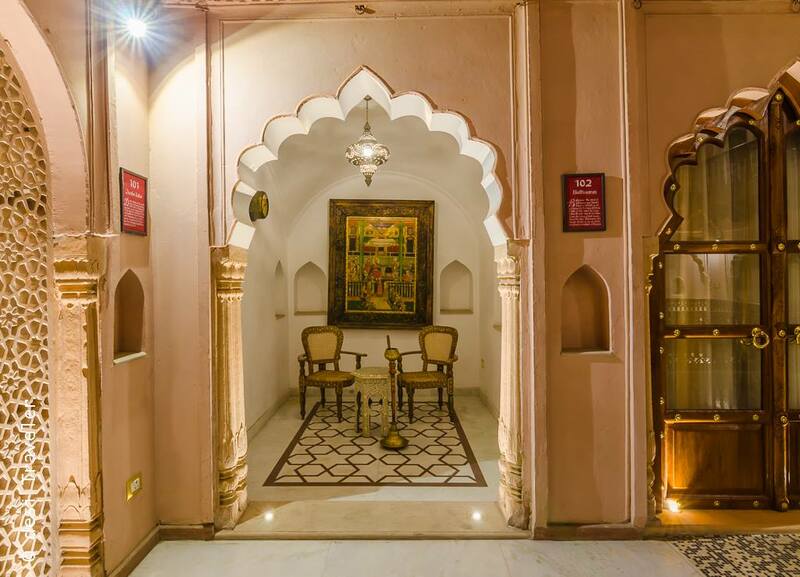 We take a walk to the rooms that give no hint of their disheveled past and are now restored to host the well-heeled traveler who wants to experience the luxuries of Rajasthan Havelis right in the heart of Delhi. There are 3 types of rooms in the Haveli Dharampura, the most luxurious ones named after Shahjahan are Shahjahan Suites, then we have Diwan-E-Khas room, named after the Court of Shahjahan. 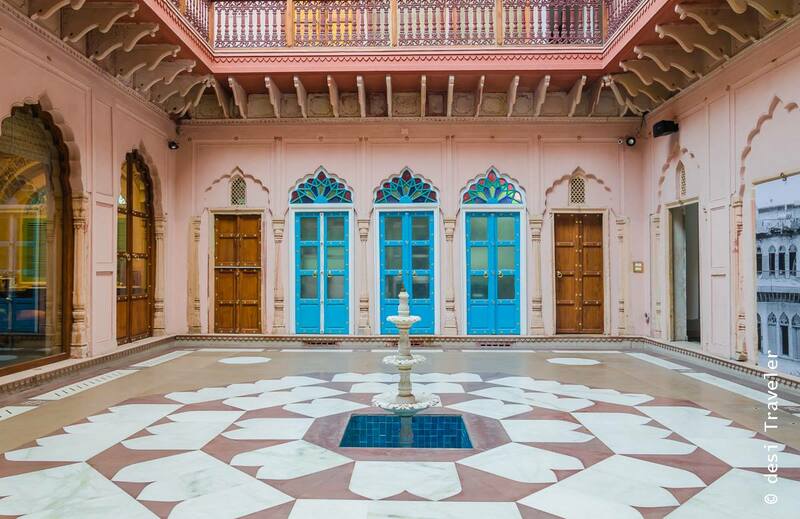 The courtyard facing rooms are called Jharokha rooms, named after the latticed stone windows, so characteristic of Mughal and Rajasthan palaces that allowed the women of the palace to look at the proceedings of the royal court without coming out. 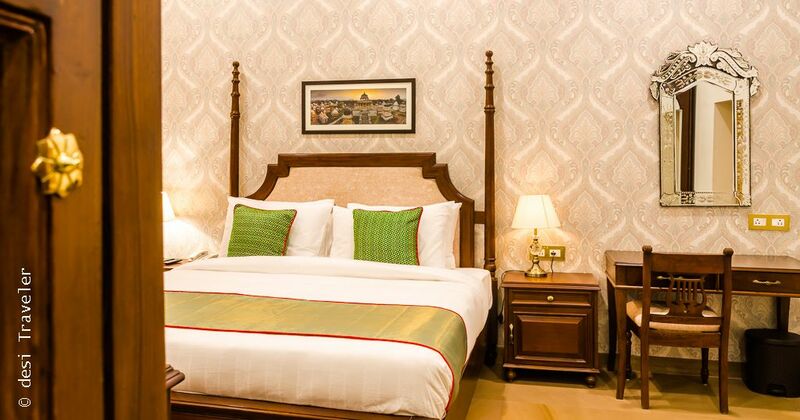 Each room has been tastefully done and offers all modern comforts while cocooning you in personalized luxury that radiates class and character, such a rarity to find in today’s modular hotels churned out on assembly lines. 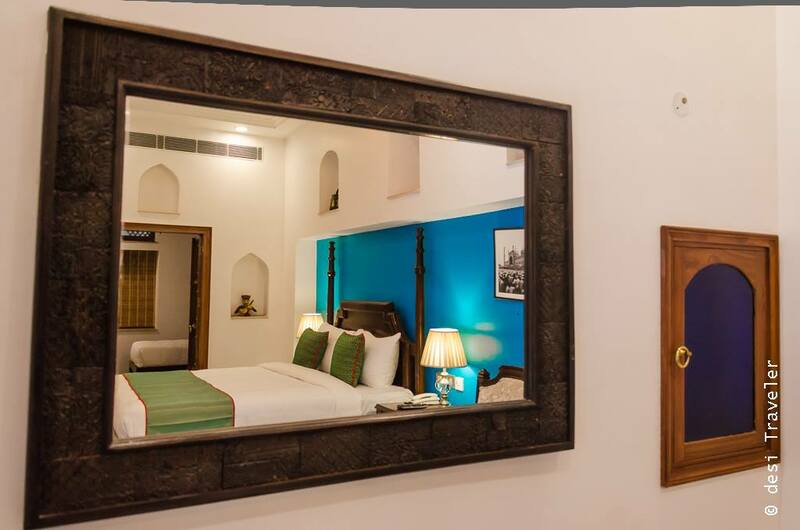 I would say if you are a visitor to Delhi and always wondered where to stay in Chandni Chowk, Old Delhi, then to experience the charms of Old Delhi, with all the modern comforts and pampering to spoil you, check into Haveli Dharampura. If you are a Dilliwala, then this is a moment to feel proud as this is not just a Haveli or hotel it is a beginning of revival of Chandni Chowk, that will hopefully increase the visitor footfall in the area and give them the option to enjoy traditional street foods of Delhi, without the heat and dust of the streets. 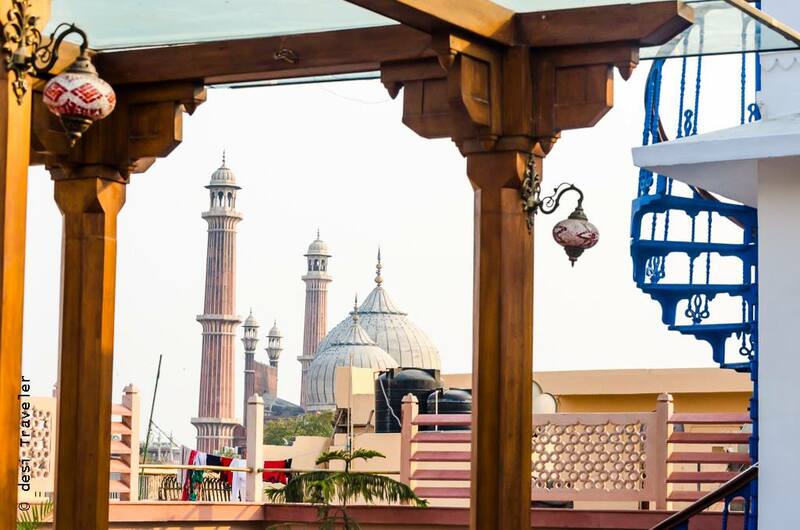 You can sit in the rooftop restaurant, look at the kites around you, as sounds from the streets and shrines around you merge to give you your Incredible India experience. 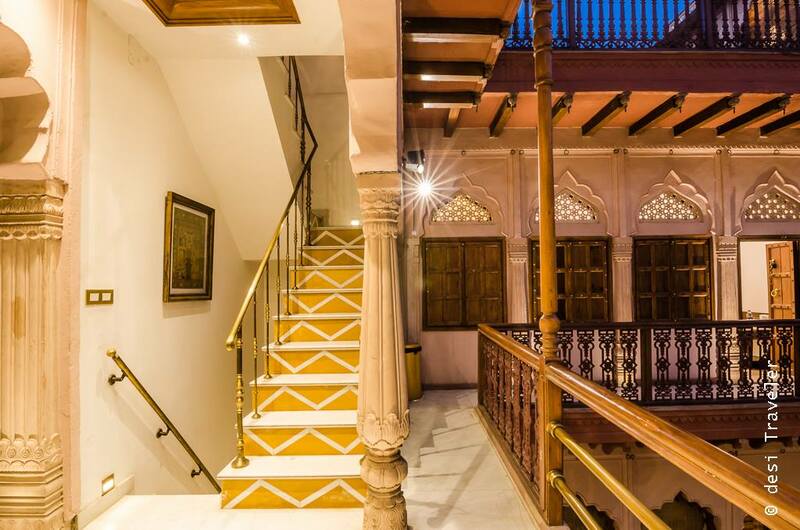 More to come at Haveli Dharampura: There is a small art gallery that plans to promote local artists, photographers, and students to learn about Delhi Heritage and restoration work. 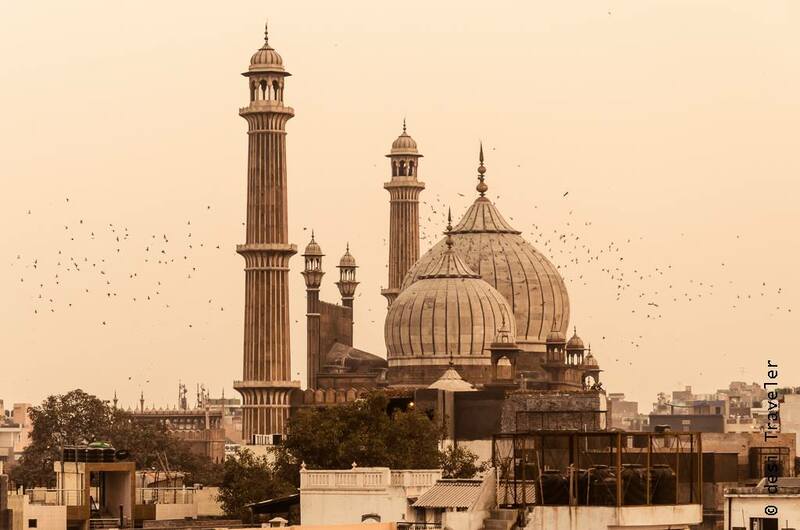 There are also plans to hold cultural events to promote Chandni Chowk as a cultural and heritage destination. 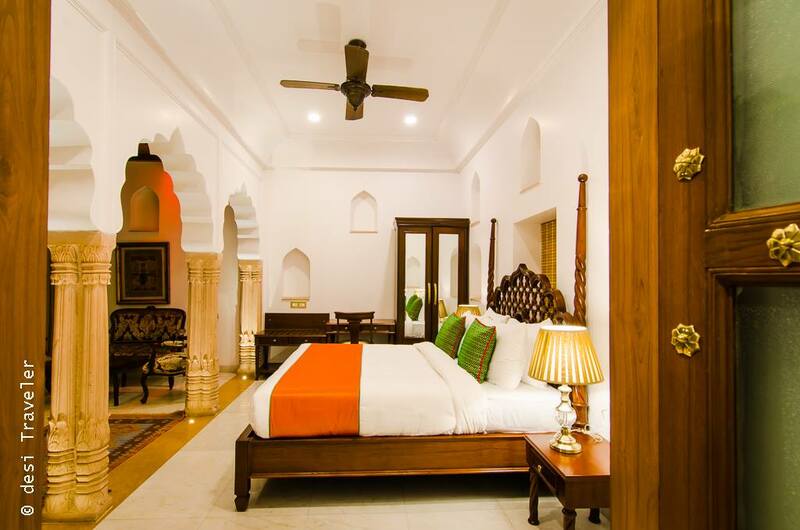 The Haveli Dharampura is now open to take bookings for the rooms. The food photographs still came out AWESOME!! 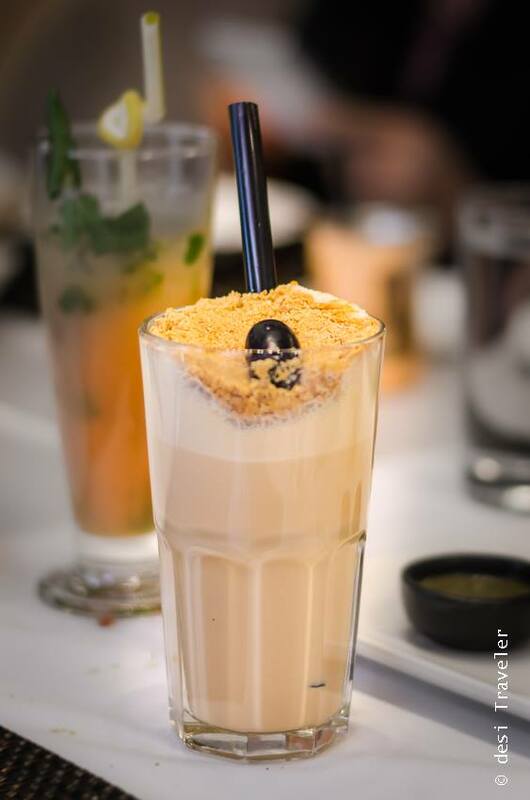 The biscuit chai looks interesting and the other things look so yum yum yum!! 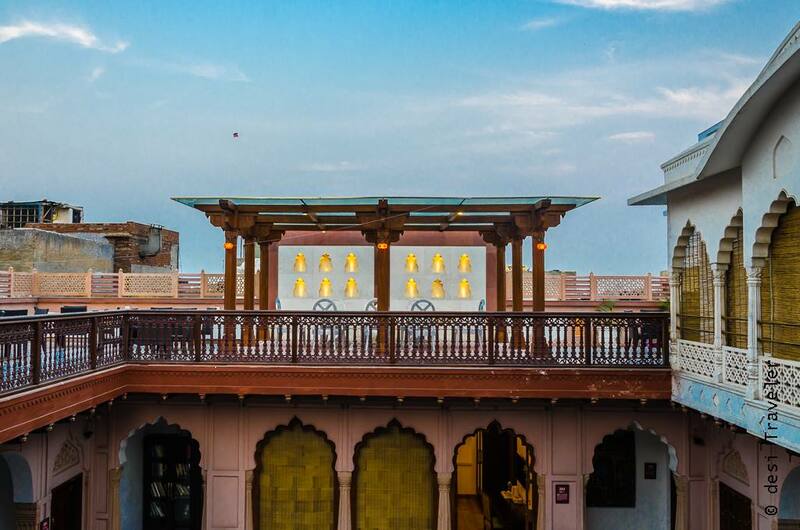 Amazing pictures and beautiful haveli. I am completely sold out on the view! What lovely pics sirji… so enticing 🙂 this would be such a perfect setting for a wedding or a weekend getaway within the city!! Wow! What a beautiful place. All your pictures are taking us there virtually.